The club currently has four qualified coaches available to give lessons during the evening. Margaret Warner and Joyce Ryder have run Affondo for many years and have coaching qualifications and experience across all three weapons. Tracy Russen coaches Sabre and Tony Rose Foil with our junior groups. Also available for private lessons during the course of the evening is Professor Bob Bales. Bob has over thirty years of experience and has coached a range of successful fencers. Fencing is a wonderful sport giving you a mind and body workout at the same time. 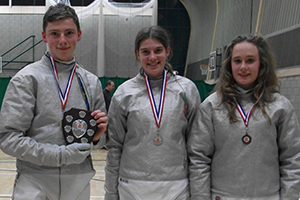 All levels are catered for from beginner to competitive fencer and all necessary equipment is provided for beginners. If you’re looking for a new way to get fit or a different activity - try fencing. To contact us for further information, please see the details on the contact page. Please note that parking is available for newcomers via the Newmarket Road entrance to Town Close School. .